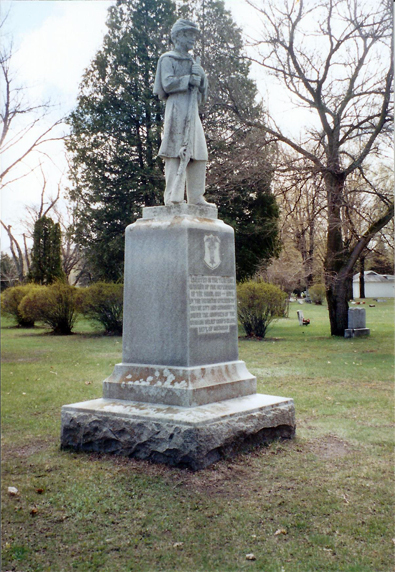 Standing in the center of the beautiful plot devoted to the old soldiers, at Maple Lawn Cemetery, is a majestic monument rising 13 feet, 6 inches. The entire monument is carved from the best granite obtainable in the world, the famous Bane granite coming from Bane, Va. The first base, 5 feet, 2 inches square, and the second base, as well as the surmounting figure is of the gray cast while the shaft is of the bluish granite without a flaw, a splendid specimen of the superior monumental material. On the shaft the following inscription is artistically carved: "Erected in the year 1916 in honor of the defenders of the Union, 1861-1865, by the patriotic citizens of Boyne City and community under the auspices of the Women's Relief Corps No. 195, Department of Michigan." 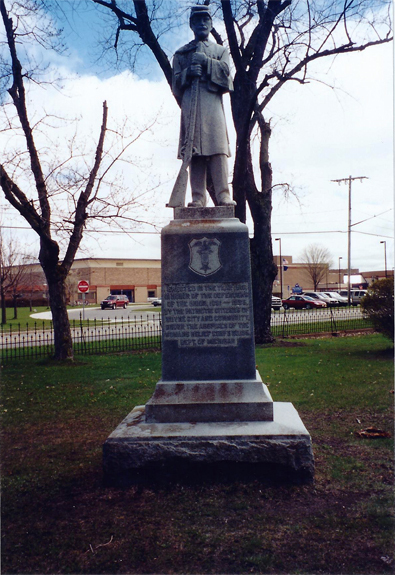 The figure surmounting is that of a Union Infantryman standing at "parade rest". It is the average height of man, 5 feet, 10 inches. The monument entire weighs eight tons and cost $900.00. This price is about $300 lower than the regular retail price, the A.W. Richard Co., of Traverse City, from whom it was purchased, making the reduction out of consideration of the purpose for which it was bought. That the testimonial to the soldiers of the Civil War stands in Maple Lawn is due to the untiring efforts of the local W.R.C.. That these efforts are appreciated will be acknowledged by a splendid attendance on Memorial Day when appropriate dedicatory services will be held.